The Canyon 49 Grill’s outdoor patio will be the venue for the Canyon Worship Songwriters Showcase on Monday night. Twice a year, family, friends and Christian music fans on the Grand Canyon University campus get an inside look at the creativity of students in the Center for Worship Arts. Monday night, the event will provide an outside look, too. 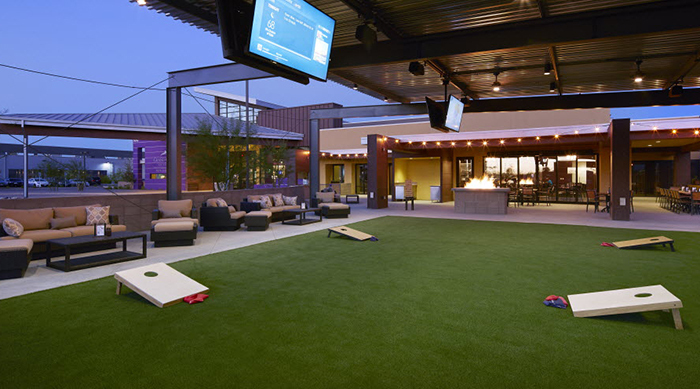 The venue for the Canyon Worship Songwriters Showcase – Spring 2018, scheduled for 7-9 p.m., will be the outdoor patio of the Canyon 49 Grill. There are some comfy sofas and chairs there, but attendees are urged to BYOB – Bring Your Own Blanket. 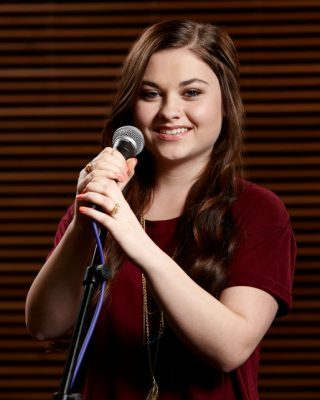 Katie Brown will be one of the performers at the Showcase. Many of those students are perennials in the annual Canyon Worship album, which draws its songs from those submitted for the previous year’s showcases. Monday’s 12 finalists were chosen from about 50 submissions. The list ranges from freshmen, such as Calderon and Myers, to more experienced performers, such as Denson and Brown, both of whom can be seen and heard regularly on Mondays in Chapel. Having two songs is a milestone for Denson. “It just happens organically,” he said. “It’s always neat to see what happens when they put their heads together. Creatively as a group, it’s something that’s better than any one of them could have done on their own. Students can take a shuttle from the main campus to get to the Canyon 49. It will leave the Building 57 stop at 6:10, 6:30 and 6:50 p.m. and also will stop at the Colangelo College of Business, Lopes Way and Sedona Hall as it heads north to leave campus. Once they reach the Canyon 49, students can use their Dining Dollars to get food, if they like. The event will have an informal feel, with no stage. “New Christian songs written by GCU students in a casual new GCU outdoor venue … what an awesome way to close a Monday night,” Johnson said.